US equities sentiment is not at an overbullish or overbearish extreme. 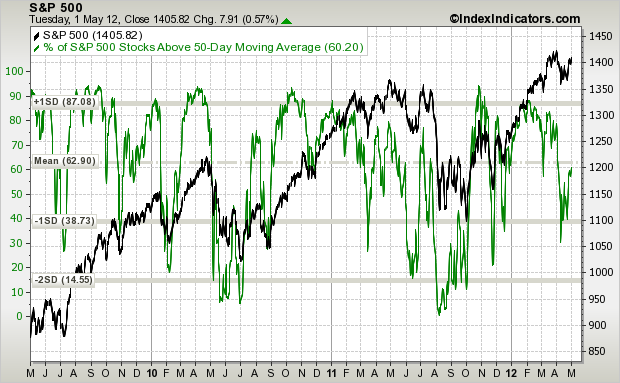 US equities are also neutral by intermediate overbought / oversold indicators. We need to look elsewhere therefore for clues about direction. 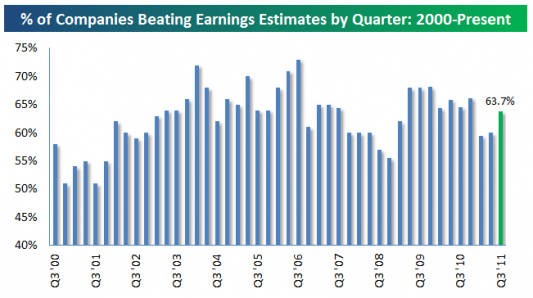 US earnings this quarter have a beat rate of 69%. That makes it one of the best of the last decade, if applied on this historical chart. Forward guidance has been good too, so that’s all positive for equities. 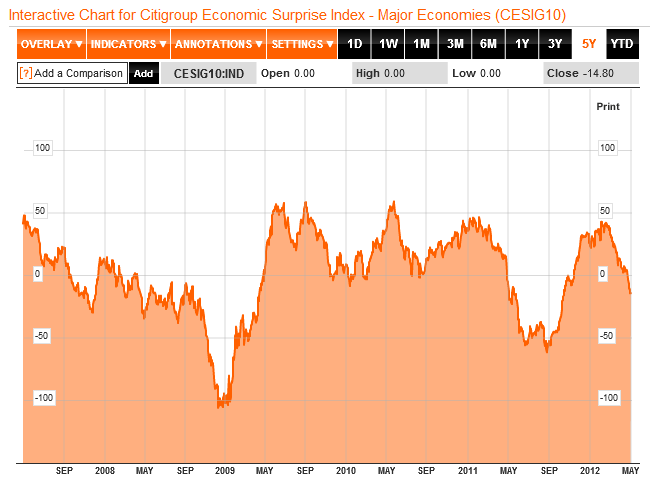 Yet, economic surprises continue to plunge. The last time we saw such a plunge from the high extreme swiftly into negative territory, equities range-traded for a couple of months and then dropped sharply (July 2011). 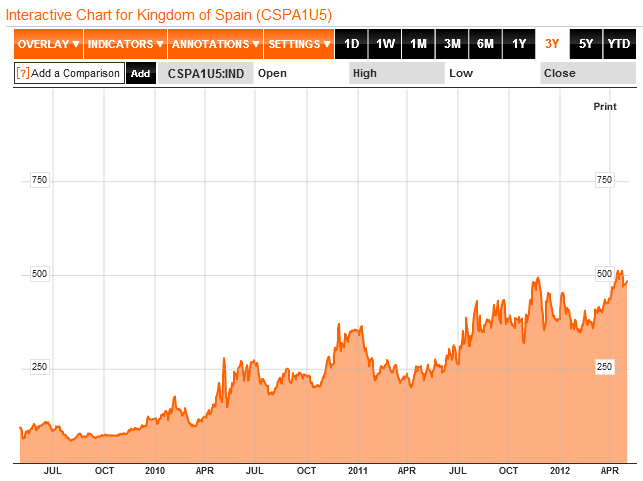 It was a time when Euro debt came to the fore, and Spanish debt has done so again. Euroland economic data is currently bad. Asia is looking brighter, although there is some mixed data out of China. Nevertheless, the Shanghai Composite has made a higher low, broken above the down sloping resistance and now needs to make a higher high above the horizontal resistance to make a compelling new bull trend. 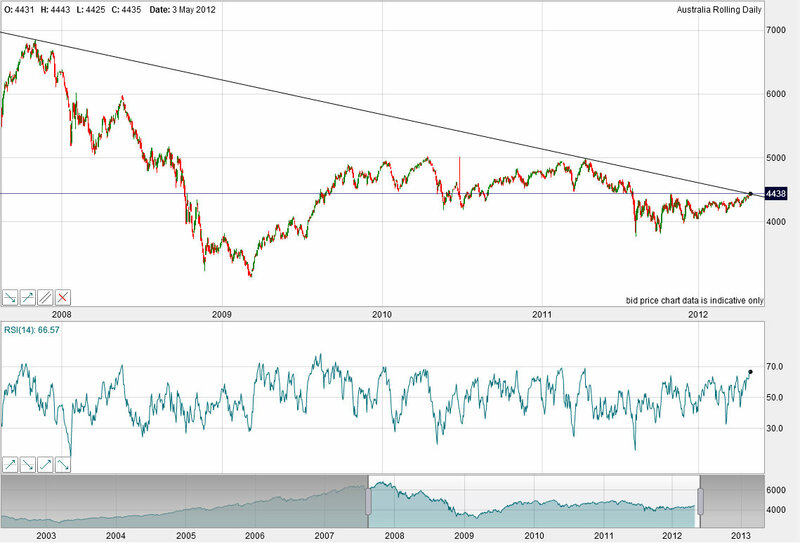 The Australian ASX is at a key point, the merging of both long term down sloping resistance and horizontal resistance. 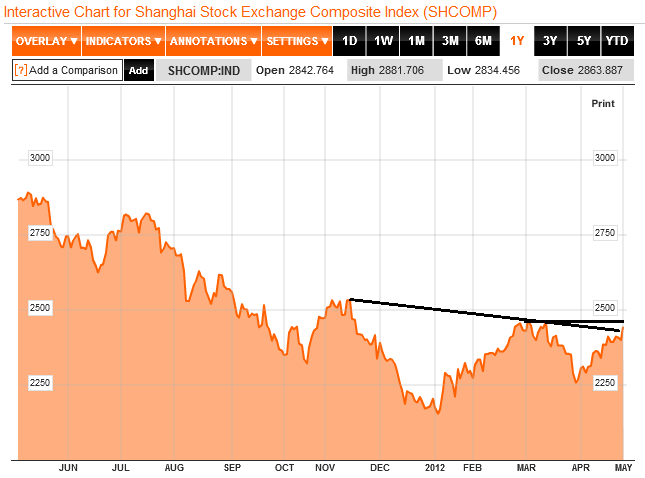 The Hang Seng made a bullish breakout, as shown yesterday. Plus as also previously noted, commodities display some technical and sentiment reasons for bull moves ahead. All together that makes a mixed picture. Some key bullish / pro-risk developments, and some important bearish / safehaven developments. Recall that historic parallels (solar cycle secular commodity conclusions) showed overall sideways action in equities with volatility whilst commodities broke away to their bullish conclusion. The current mixed picture would support that overall sideways action in equities, but we perhaps need some other development to give commodities acceleration. That could be through further central bank intervention, in response to persistent Euro debt trouble, continued falling economic data or to replace Twist with something when it ends in June. For now then, I continue to watch leading indicators and developments in the key areas noted above, and await assets moving to extremes in sentiment or overbought/oversold readings. Just as I believe there’s a 6-year pattern going on in stocks, with a 2006 repeat in 2012, gold prices seem to have followed a similar pattern to how they did in 2006. In my opinion, gold will follow the movement of 2006, with a rally in price only really occuring in 2013-14, ultimately peaking in early 2014. Greece’s borrowing costs have dropped in recent months from 30% all the way down to 20% on 10yr bonds, so perhaps Spain and Italy will be the focus of attention, or even France with its new Socialist administration being at odds with Merkel’s strategy. Would like to know what you think will happen on the inflation front. The ECB’s already printed €1trn in the last few months, and the UK’s been using a new round of QE since October ’11. 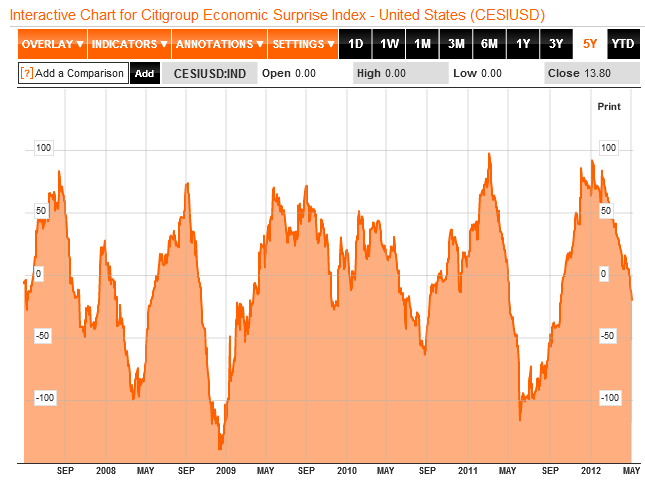 Only a matter of time before the US initiates QE3 perhaps?